Use our Destiny 2 Leveling services for your new Guardians to skip grinding and farming and get right into the action. We provide fast and reliable character leveling which includes various additional options you can select, such as fully unlocking your subclass, reaching 230, 260 or even 300 power levels. Basically everything your Guardian will need to right into the action and enjoy the game without having to waste your time leveling. Our Destiny 2 leveling service supports all 3 platforms - PC, Xbox One and PS4. To order you just need to select the amount of levels you require, for example, if you are already level 7 and want to get level 20, you just need to select 13 levels. How can I contact you if I have some unanswered questions? You can contact us on live chat, which is located at the bottom right corner of the website. We are live 24/7! 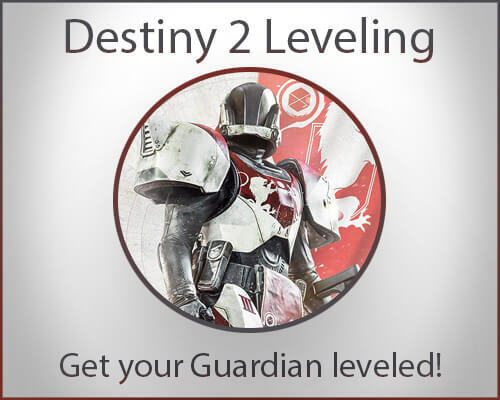 Can I order leveling for more than one Guardian? Yes, add to cart first then click continue select new options and add to cart again and checkout. Can I play other games on my battle net? Yes, you can play other games on your battle.net but not Destiny 2 until we are done. How do I track the progress or how do I know the job is done? You will be able to chat with your booster through out the whole leveling process, he will keep you updated on the progress and will tell you once it's finished. You can also ask them various questions about the game, they will gladly help you! Got my guardian to 20, thx!